"How long does it usually take to get a grant?" "What's a typical award amount?" "If I apply for 2 or 3 grants, will I get at least one?" Each year - twice a year, actually - you can get answers to these questions and many more. Published by GrantStation, The State of Grant Seeking Report sheds light on trends in the "grants world." In their words, the goal of this semi-annual report is to "understand the recent trends in grant seeking and identify benchmarks to help you measure your own success in the field." Remember this: just like diets and exercise programs, your actual results will vary. Even so, the data does help paint a picture of "the state of grant seeking." WHO'S APPLYING FOR GRANTS AND HOW MANY DO THEY SUBMIT? You're in good company if your nonprofit applies for grants. In recent years, in any given six-month period, more than four out of five nonprofits apply for some type of grant. The number of submissions varies widely. 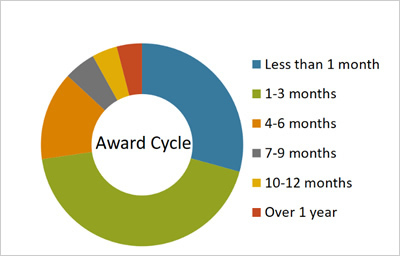 This shouldn't surprise you: the more grants that an organization submits, the more likely they are to receive an award. Many grant seekers continue to target private foundations for grant funding. Roughly a third of nonprofits also apply to federal, state, and local governments. Historically, foundations prefer to fund programs. However, nonprofits seek (and often win) other types of support. 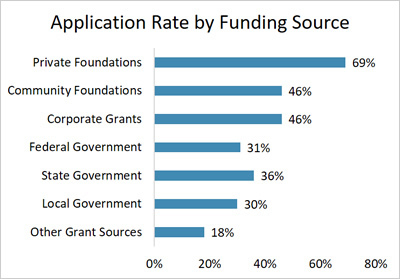 22% of foundation grants funded general operating needs. HOW MUCH DO FOUNDATIONS AWARD? Individual grant awards will vary dramatically - from a few hundred dollars, to a few thousand, to six- and seven figures, or more. 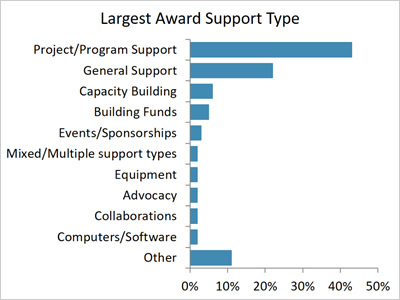 Just over half of the respondents (51%) reported total grant awards to be under $100,000. The smallest grant from a private foundation was $400. The median grant from all private foundations was $40,000. Remember, nonprofits also receive grants from foundations, government funders, and other sources, like United Way. HOW LONG DOES IT TAKE TO "GET A GRANT?" Sometimes, writing the grant is the easy part. Waiting for a response is the hard part. After you submit your grant, it can take weeks - even months - to learn if you'll be funded. 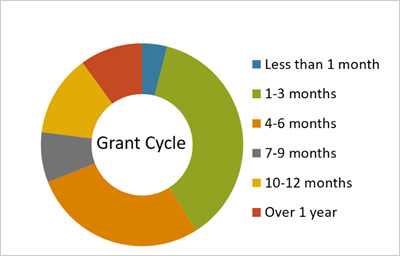 65% of respondents said the grant cycle was between 1 and 6 months. 31% said the grant cycle was 7 months or more. And, even after you get the happy news, it can be even longer before you receive the funds. 72% of respondents said the funding cycle was within 3 months of notification. 28% reported that it took 4 months or more to receive funding after the approval. There's a lot of uncertainty these days, around government funding and the fate of certain programs. Maybe even yours. One thing that's for sure, there are tens of thousands of well-funded foundations. Today's economy and the current bull market have boosted the assets of these foundations. As a result, foundations will continue to be a source of funding for many, many nonprofits. Again, maybe even yours. That doesn't mean that it will be easy. Nonprofits cite many barriers to their grant writing success. If you want to be successful winning grants, you need to ask the right foundations, for the right amount of funding, for the right program or project, at the right time, and in the right way. Third Sector Consulting is your partner in philanthropy. We'll guide you on your grant writing journey - to find more funders, win more grants, and raise more money for your nonprofit. Let us know how we can help you. NOTE: All information in this post is from the Fall 2017 State of Grant Seeking Report. More than 4,000 people participated in the survey. If you'd like to be part of the next report, take the Spring 2018 State of Grant Seeking Survey, which is open through March 31, 2018. Want to learn how to write great grants? And how to find foundations that are interested in funding your work? Laura Rhodes can help.